Spanish hand washing songs are a good way to get more language into a day and cleaner hands. If kids wash their hands the whole time they sing, they wash more thoroughly. Kids learn Spanish vocabulary and grammar as they sing these Spanish hand washing songs. The action of washing helps them associate the verb lavar with its meaning. Depending on the song, they also learn words like agua, jabón, sacudir, secar, etc. Children wash their hands many times a day, so there is ample opportunity for repetition. This video about soap fits perfectly into any discussion or lesson about hand washing. Pamela talks about different kids of soap and clean hands in easy Spanish. There are even bubbles! Children can learn lots of Spanish from other daily routines. Read about 6 Chores to Learn Spanish Vocabulary and 21 Ideas for Adding Spanish to Bedtime. This is one of the easiest Spanish hand washing songs I know. It is to the tune of La bamba, and I have used it for years. The words are Yo me lavo las manos, yo me lavo las manos con jabón y un poquito de agua. I like this song because it includes las manos, la cara, and el pelo. It also teaches the verbs lavar, sacudir and secar. In addition, the song ends with todo limpio – important related vocabulary! Many thanks to Chiquimundo for letting us share their song. You can learn more about Chiquimundo on their website, follow them on Facebook, and find more of their songs for Spanish learners on Soundcloud. Chiquimundo also has songs and videos of finger plays on this playlist on their YouTube channel. Singalingo also adds a cute tune to the collection of Spanish handwashing songs. It mentions manos, cara and dientes, and uses the verb lavar throughout the song. You can hear the song in the video below, and learn more about their songs and preschool curriculum on the Singalingo website. This song is longer, but it also a fun one for kids. In addition to las manos a lavar it has lots of familiar vocabulary about when we need to wash hands. You can certainly teach kids to sing the chorus several times as they wash and teach the rest of the song with the support of the video. 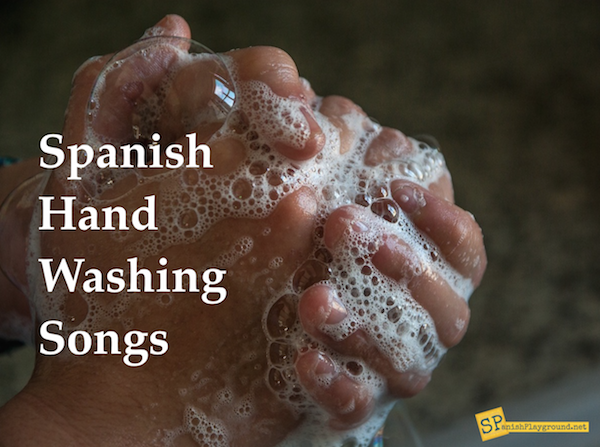 Do you have a Spanish hand washing song that you use with your children or your students? Please share in the comments so we can add to this collection!